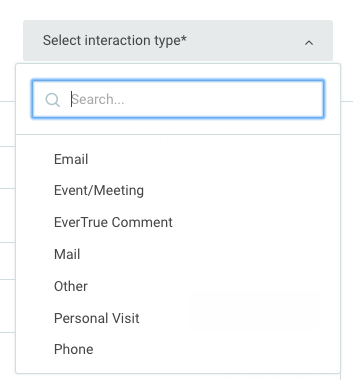 There is a lot to consider when setting up and configuring your interaction form in EverTrue. Use the guide below to help you through the process and make sure everyone in your office is onboard. While the form can be edited and re-configured at any time, it is recommended to start off with a well-established and set form for your team. We suggest having an all-hands internal meeting to establish your interaction form and set guidelines that will be used by your entire institution. Here are a few questions to help get that conversation started. How do you expect your users to interact with the form? When? How often? Will EverTrue's interaction form be the primary entry method of interactions? Will your team still be able to enter interactions in your database? Are you looking to simplify or improve your current process? If so, how? What fields do you require from your team when writing an interaction? What teams at your institution will be using this form? Does every team use the same process? Will you need to combine requirements from those teams into a singular institution-wide form? Do the interactions need to flow back and forth between EverTrue and your database? How often? The answers to these questions will inform the choices you make for your interaction form. From this base, we can build you a customized form with any of the following configuration options. The primary way to add additional fields to your form is through custom fields. Custom fields will be configured for your institution by your implementation specialist or the EverTrue support team. It is important to note that any imported interaction field will be included in your EverTrue Interaction form at this time. However, the values in that field can be adjusted (added, removed, or updated). If you would like to add a field to your interaction form that was not imported, send us the name of the field, the type of data (see below), if it is required or not, and the values you'd like to include (if relevant). Custom Fields can be any of the following types: Date, Number, Currency, Boolean, String - Freeform, String - Pick list. All custom fields will display below our standard fields. However, we can order the custom fields within their own section. If you have a preferred order, let us know. 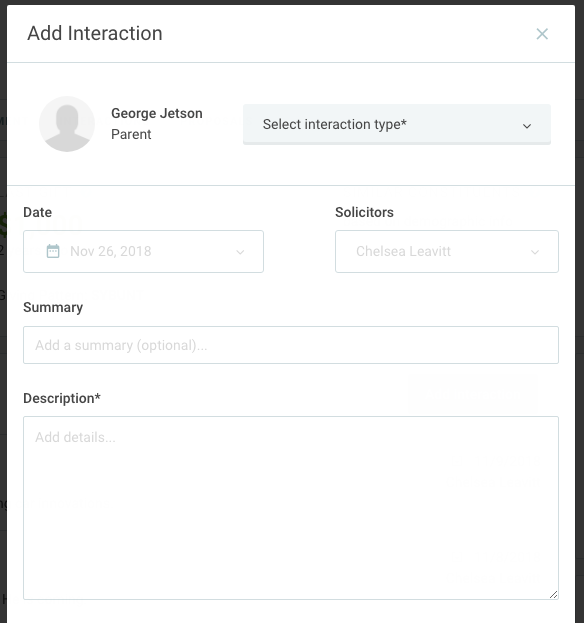 Allow your interaction form to reference more than one constituent by adding an "Add Constituent" button, which allows the user to attach the interaction to any number of additional constituents. E.g. Entering an interaction for a meeting with a husband and wife where you enter the primary interaction on the wife's record while adding the husband as an additional constituent. Set a maximum value for the number of entries that can be input for these fields. This is helpful in setting guidelines for your team. It is also reflected in the interaction CSV export by keeping the number of columns for that data static, which is important for scripting your data back into your database. EverTrue automatically populates all imported interaction types into your interaction form. However, this list of types can be edited to update, remove, or add any values you need. Send the list of Interaction Types you'd like to include in your form to your implementation specialist or EverTrue Support. For example, if you have a historic type, like 'Presidential Meeting,' that you no longer want your team to use, we can archive that type so it is no longer available when entering an interaction, but the imported data is still in place and available for filtering in EverTrue. Please note that " EverTrue Comment" is a default interaction type in your form that cannot be removed. EverTrue Comments are a way for users to message each other or tag constituents for reference. EverTrue Comments are not exported in the Interactions CSV file.